All I Want for Stern to do within my lifetime is this .... (pick multiple) You can always change your vote and suggestions made with 24 hours may be added to poll. How about just continued success??! Ghostbusters needs a code update, but it's an enjoyable game when bugs aren't getting in the way (namely the reset issue usually [always?] during Mass Hysteria--have read others having the same issue). Usually don't get far enough to experience an issue with that. Rob Zombie is the one I feel I have yet to play the real version of and really hope we get an update eventually, even if it doesn't have all of what was promised when Ben was still there. Needs some bug fixes (sounded like that aspect was already in the beta), but really just needs one mini-wizard mode to make it feel like a more full progression (believe they claimed there would be two at one point, but that wouldn't be necessary). I was also hoping to do my own audio swap once code was final. Apron mod has also been disappointing considering what was suggested would eventually be in it. I know David has been swamped though, so I feel bad for both ends of it. What is incomplete in WPT code? I voted for a few. If Stern just keeps staying successful while not getting stale that’s fine with me. I wish they’d finish code for some older games that were forgotten, even if I may never own them, it would be neat if they’d finish them for the folks who love those games. GB needs it’s code finished because I hated it at first and the most recent code put it back on my top 10. Also I played the Beatles and it was amazing and if they had a full catalog Beatles game that would be pretty incredible. "$5k Sterns - Gary vows to hold line on pros, squeezing boutique industry out-of-business"
I hope that we can have both reasonably priced Stern pro models and successful boutique pin companies. Stern’s software team has found a way to catch up on the backlog of past games, with GB and DP remaining. A few could benefit from final bug squashing or minor rule tweaks - GOT, AC/DC and ST - but it is ok that these may never happen. However, new games coming out need full code at release - Munster, and Jaws. On the remake front - we want at least one vault named LOTR or TRON. Star Wars topper is out finally, so it can be crossed off the list. But $500 - ouch. Toppers should not be a mega profit center, rather they should be a more realistically priced $250 - $300 ... unless the topper is plugged more into stuff on the code. Then $500+ wouldn’t be so off base. 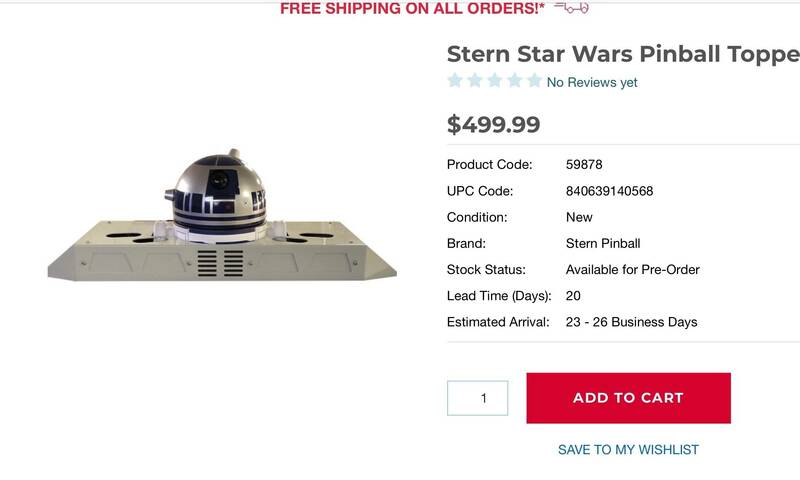 <insert favorite joke> ...at that price, R2D2 should make you breakfast. Star Wars topper is out finally, so it can be crossed off the list. But $500 - ouch. Toppers should not be a mega profit center, rather they should be a more realistically priced $250 - $300. Dome rotates and lights up or projects on the wall, right? I can’t imagine it not being interactive. Disagree. It's a non essential, superficial adornment like powder-coated metal pieces.